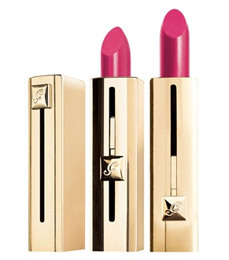 Guerlain has been selling their Rouge Automatique lipsticks for a little while. The most notable thing about this line of lipsticks–and why I’m discussing makeup on a perfume blog–are the names being used. Guerlain’s calling their lipstick shades after their classic perfumes.That’s right, you can get Shalimar, Mitsouko, Vol de Nuit and even Jicky in lipstick form. It’s totally a gimmick but I love the naming scheme and I love the classical look of the lipstick “tubes”. The major downer about these lipsticks are the price. Being Guerlain products, these are not cheap which is really where a lot of makeup consumers might fall off the interest bandwagon. I can add, however, that the lipsticks themselves are not just cheaply made bullets slapped into gimmicky packaging and given gimmicky names. The product is actually very good, has a great consistency, and a faint and pleasing aroma. I just wish the price was a little more sane. Oh and I should mention this because I was curious about it too until I actually got to handle one for myself–the packaging material is plastic. I know, it looks nice and looks like it’d be a brilliant piece of metal packaging (like Guerlain’s luxurious Rouge G line) but it’s, unfortunately, just plastic.